The Five Mindfulness Trainings are one of the most concrete ways to practice mindfulness. They are nonsectarian, and their nature is universal. They are true practices of compassion and understanding. 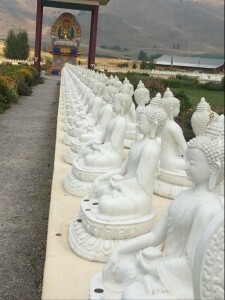 The Five Mindfulness Trainings are based on the precepts developed during the time of the Buddha to be the foundation of practice for the entire lay practice community. a) I am determined not to kill, not to let others kill, and not to support any act of killing in the world, in my thinking, or in my way of life. a) I am determined not to steal and not to possess anything that should belong to others; and I will share my time, energy, and material resources with those who are in need. a) Knowing that sexual desire is not love, and that sexual activity motivated by craving always harms myself as well as others, I am determined not to engage in sexual relations without true love and a deep, long-term commitment made known to my family and friends. a) When anger is manifesting in me, I am determined not to speak. b) I am determined not to spread news that I do not know to be certain and not to utter words that can cause division or discord. a) I am determined not to gamble, or to use alcohol, drugs, or any other products which contain toxins, such as certain websites, electronic games, TV programs, films, magazines, books, and conversations. b) I am determined not to try to cover up loneliness, anxiety, or other suffering by losing myself in consumption. It was a bit surprising to me to see the word “decision” in the definition, because I do not always relate to determination as an active choice. In fact, I have always thought of determination as more of a passive perseverance or perhaps unyielding motivation. However, according to this definition, determination begins with a decision. Rather than some kind of dogged pushing through, strong determination involves connecting with joy, relaxing and trusting. It’s determination to use every challenge you meet as an opportunity to open your heart and soften, determination not to withdraw. I really like Pema Chodron’s description of “determination” because it rings true with my own experience. About three years ago, I took the Smiling Like a Buddha class and decided at that time that I wanted to sit for at least 10 minutes every day. For the past three years, I have experienced how that decision has become the determination for me to continue my practice on a daily basis. Most of the time, it seems my determination is borne out of desperation to change unfavorable circumstances. Realizing I am not happy with various circumstances, I become determined to change. Determination requires a decision to make time for practice. Oftentimes, it means practice comes before other things. Practice moves to the top of the priority list. By being determined to study and practice what I have learned, other things fall into line and the change happens. For example, noticing how I am feeling allows me the opportunity to offer myself compassion, which allows me to be kinder in my responses to others. 1. What is your experience with determination? 2. What has motivated you to be determined in your practice? 3. How do you stay dedicated to your determination?